Who could forget the classic line, "i know kung- fu" that Neo utters as digital information is downloaded through a massive frikking needle directly into the back of his skull. And who thought to themselves, 'i want that too' when they saw this scene. Lets be honest here, wouldn't learning be a whole lot easier if you could upload knowledge and info directly into your brain, just like in The Matrix? Think about it, you would sure save you all those years of dull and tedious schooling and a fortune in student loans. Well a group of researchers at HRL Laboratories have been working on a project that could one day lead to such technology and are taking the first steps into developing advanced software that will make Matrix-style instant learning a reality. They reported on their website, "It's a case of life imitating art. Much as the sci-fi film "The Matrix" depicted a device capable of enhancing skill acquisition, researchers at HRL Laboratories, LLC, have discovered that low-current electrical brain stimulation can modulate the learning of complex real-world skills." The group studied the electric signals and brainwaves of a trained pilot and then fed this data into novice pilots using electrode-embedded head caps. "We measured the brain activity patterns of six commercial and military pilots, and then transmitted these patterns into novice subjects as they learned to pilot an airplane in a realistic flight simulator," said Dr. Matthew Phillips who led the research. The study found that the novice pilots' who had received the brain simulation had improved abilities. Which doesn't mean that you'll be learning kung-fu in an instant any time soon, but it could assist and help accelerate when people are learning a new skill. 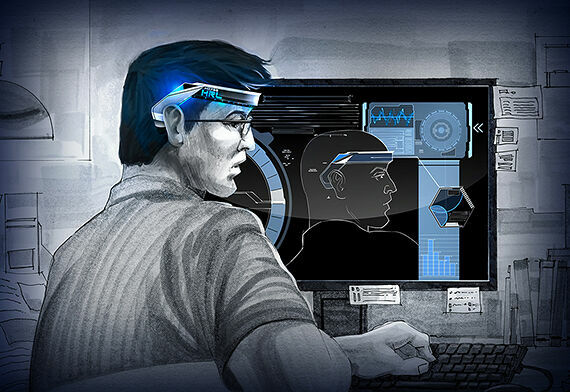 "As we discover more about optimizing, personalizing, and adapting brain stimulation protocols, we'll likely see these technologies become routine in training and classroom environments," Phillips says. "It's possible that brain stimulation could be implemented for classes like drivers' training, SAT prep, and language learning." © 2016 HRL Laboratories. Illustration by John Enete.